This year, I have 6 goals. 1 – To passionately pursue my marriage–pursuing intimacy and a relationship that is separate from our parenting relationship. WHY: My marriage deserves this attention. I want to experience the joy of a thriving marriage and to share this joy with my husband and our children as well. This goal involves a lot of “laying down of self” and intentionally choosing to pursue someone else’s needs over my own, which sometimes feels costly in the moment, but I want an amazing marriage–not just a good one. 2 – To transition well from youth ministry to new ways of serving in summer 2016, keeping in mind that I won’t be “done” with existing mentoring relationships. WHY: The girls that I have been loving and serving since they were in 6th grade are graduating and moving onto college. I have learned (much to my surprise) that youth ministry does not end when the students graduate; instead, you begin doing college ministry. Right now, I mentor a few girls who have moved on to college and a group of girls who are seniors in high school. When I started youth ministry, I had a dog and a youth pastor husband. 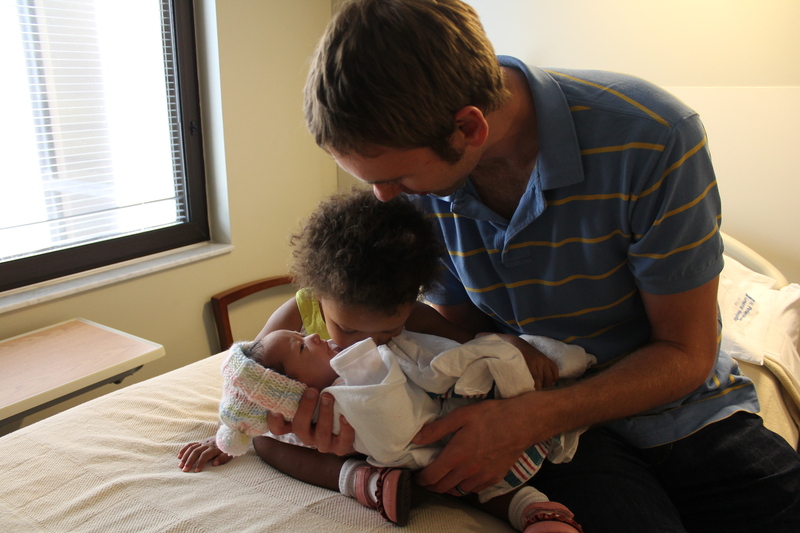 Now, I have two children with perpetual needs and an associate pastor husband. It’s become a lot more difficult to do what I really want to do as a mentor. For this reason, I have spent the last two years focusing on getting “my” girls through their seasons and not on building any new relationships. This summer, all of “my” girls will be heading off to college, in college, or freshly out of college. It’s a chance for me to switch gears. This spring, I want to prayerfully consider what ministry will look like for me moving forward, keeping in mind that I’ll still be doing some long-distance and college-break mentoring. I want to serve my church and world. I also want to be mindful of the constraints of my existing responsibilities, at the same time that I remember that I serve a God who turns a simple offering of loaves and fishes into food for thousands. I’ve been thinking about how I could assist a ministry at our church by donating some grant writing services. I am also open to other new ideas that God may share with me. 3 – Attend Jazzercise 3x week + do other frequent physical activity. WHY: The investment of my time into physical activity pays huge dividends for my ability to perform all of my other roles. I am a better mom and wife and a happier Sarah when I take this time for myself. I don’t exercise for vanity; I exercise for sanity! Although in my dream world I would exercise most days of the week, 3x a week is the perfect amount of time for my kiddos to be in the childcare program and still look forward to going, and it will keep me in reasonable shape. 4 – Continue morning devotion time and begin doing devotions with Zoe. 5 – Make $X amount this year, maintain a minimum of 3 income streams, and prayerfully and sacrificially give from my earnings to our friends’ YoungLives ministry. WHY: “Change a teen mom and change a baby.” In 2015, I wound up exceeding my income goal by 11%. In 2016, I want to continue incrementally growing my business, but I don’t want growth to simply benefit my family. God is the source of any business that I get and I want to offer what I make back to Him. Our friends in Washington are looking for support for their YoungLives ministry (Young Life’s ministry for teen moms) and I feel called to take a painful and scary leap of faith to commit to giving up some of the comfort and cushiness of my money habits to help teen moms get the mentoring and support that I benefit from as an adult mom plugged into a great family and church. 6 – Spend one-on-one time with Zoe each week. WHY: Some of my silence on this blog this spring and fall can be attributed to the fact that knowing how to parent one of my children is a perpetual challenge for me (and that actually parenting her is exhausting). I don’t think it is fair to share much online about my children’s struggles, which is why I have been pretty quiet, but behind the scenes I have been learning how to best support the needs of a child with a temperament that is very different than my own and a set of needs that is more intense than many of my friends’ same-age children seem to have. We have had some professional evaluation as part of this process and apparently, I am doing everything “right”—it is just exhausting. I notice that I feel a lot less frustration with her when I spend special time with her—time dedicated solely to studying and appreciating her unique personality and to having fun together. I want to love and know my child the way she deserves to be loved and known, and I want to enjoy and appreciate her personality—not just patiently endure it. I feel convinced that one-on-one time together is a critical part of this. This week, we start an 8-week parent/child gymnastics class that we will attend together—just the two of us. My goal is to keep some special time each week (whether it’s a class, park date, cookie date, or simply running errands) to invest in our relationship this way. Well, I hear some naptime-ending-noises, so I’m going to pop this up without proofreading and hope for the best. I’d love to hear your goals if you feel like sharing any of them with me! Honestly, we didn’t have any intention of buying a home this year. I like being a renter. I’m scared of unknown expenses, spending my weekends on home maintenance, and being tied down to a geographic area. Adding fuel to my “renters fo’ lyfe” argument is the fact that home prices in our area are ridiculously expensive, yet I don’t want to live anywhere else. After living through Rat House (which, by the way, is now legitimately a Boy Scout hut…practice your trapping inside, I guess! ), the thought of sifting through the crummy homes we could afford in this area and trying to decide was the least crappy so we could spend all of our money on it sounded pretty unappealing. Our current rental has been great (although when your standard is “not infested by rats and insects,” there’s nowhere to go but up), and I didn’t think we’d be able to find anything remotely close to our preferences—in which case, I thought, whyyyyyyy??? However, our landlords decided to sell our rental house. We don’t want to keep moving all the time, we needed somewhere to live, and it turned out we had a down payment. David said we are done spending down payments on adopting children (I know, the guy who hates the traditional Christian interpretation of “head of the household” suddenly decides to get all authoritarian on me?!!) so we began investigating the housing market with a realtor and a healthy dose of skepticism. Well! It turned out that by moving outside of our preferred middle and high school district (but staying within 3 minutes of our current neighborhood and inside my “area” boundaries) we could afford something we liked. Since Zoe and Riley aren’t even in preschool yet, we decided that we could probably risk it. Within a few weeks, we found something we liked, decided what we’d want to pay for it, put in our offer, and had ourselves a little deal. That’s not really how it’s supposed to work in this area (there’s usually drama and bidding wars), so we’re feeling like this is probably our house. Or like we are making a giant mistake that everyone but us can see. One of the two. Usually the first. We are supposed to close Wednesday, complete some small renovations the next week, and move on the 29th. I feel a little weird sharing photos of the house before it is officially ours, but I’ll share some (and some before and afters) once we move in. Sneak preview. 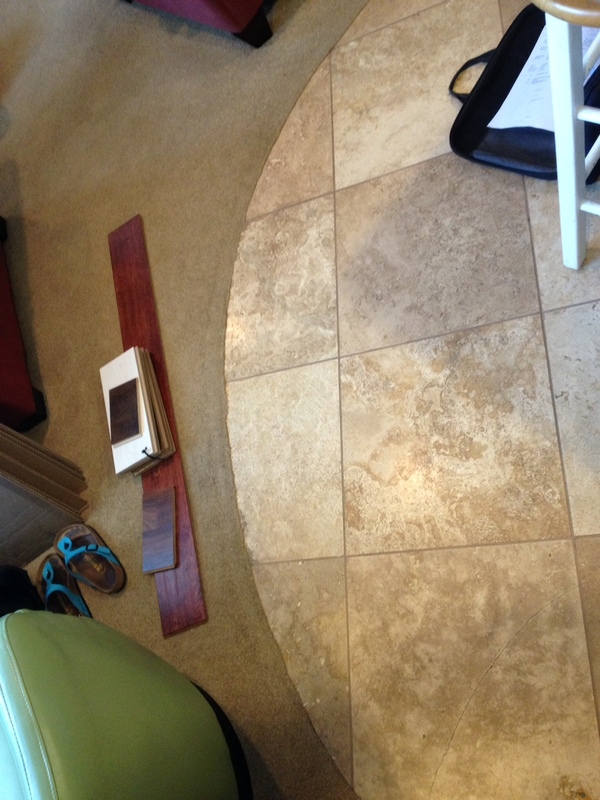 Goodbye, hideous carpet. In the meantime, we are packing, and I’ve discovered the incredibly fun and time-wasting world of home renovation blogs. While I usually use Pinterest mostly to blatantly piggyback on my friend Jaima’s meal planning efforts (thanks Jaima,) I’ve been Pinning home ideas like a madwoman recently. I have plans to implement exactly 0 of these ideas, but seeing what I’m attracted to has still been beneficial as we’ve picked paint colors and flooring and decided what our longer-term furniture goals are. Yes, I suddenly have long-term furniture goals. Mom, you should be proud. More sneak previews: my favorite features of the house are the open floor plan, the huge backyard, the updated kitchen, the French doors going out to the backyard, and the bonus that my friend lives next door! More to come if closing is successful! I’ve always been a big goal setter. New morning, new week, new year–it doesn’t matter. I love the new. Opportunity and possibility are intoxicating to me, and so the end of December (my birthday AND the beginning to a new year) is basically excitement central for me. This December, though, instead of thinking and praying and journaling and talking enthusiastically about my goals—I mostly find myself quiet. This year didn’t really pan out exactly as I pictured it. I actually have accomplished a lot of the goals that I set last December. That part isn’t surprising; I set good goals. But the context in which I’ve met these goals is so different than what I thought it would be. 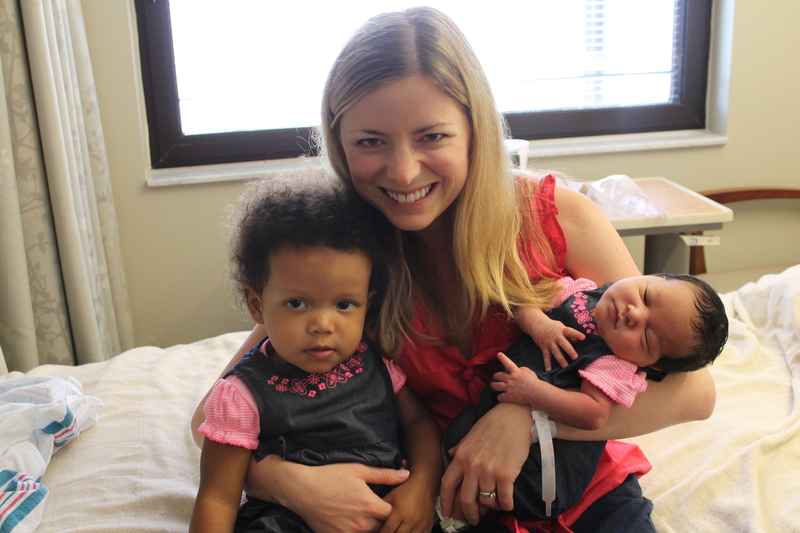 Last December, I shared with my family that I would become a mother of two in 2014. That is true. It happened about five months later than planned, and with a different baby and set of circumstances. Last December, I set some business goals. I met those goals, but with a different line of work than I had planned on. Last December, I set goals—picturing how I’d live them out in my daily routine, house, neighborhood, schedule, life. My day-to-day life looks completely different now. 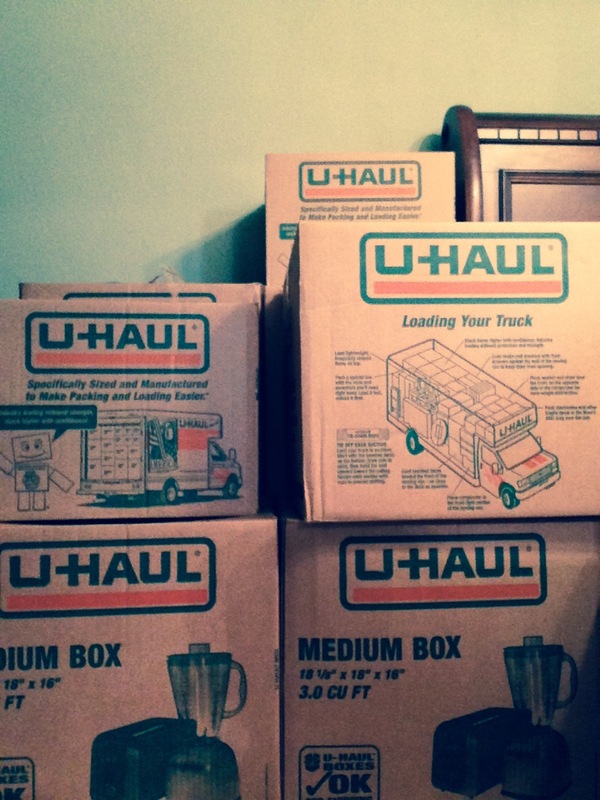 We moved, had an extra child, and both changed jobs. I wash my dishes in a new sink, walk my dog in a new neighborhood (and less often…sorry, pup), mother one child with less attention than I could give her in the past, somehow meet the needs of another too, work for a new organization, and feel a different weight and responsibility from my husband’s job than before. I went from feeling like a confident mom for whom mothering was easy, to a mom who has to ask Jesus daily for wisdom and patience and ability and energy because being the primary caregiver for these two little lives is the hardest job I’ve ever had. I’ve implemented the spirit of those goals into my new life and situation, but I certainly didn’t picture all of this last December. Honestly? After a few great years in a row, this year held many struggles for me. Most surprised me. What got me through was the knowledge that “I the Lord do not change…” (Malachi 3:6) and “Jesus Christ is the same yesterday, and today, and forever” (Hebrews 13:8). Nothing was a surprise to Him. Nothing changed His goodness. And I trusted Him. 2014 wasn’t my favorite year in history, and it certainly isn’t what I pictured—but on the eve of 2015, I find myself at peace with the struggles, journey, and joys the year held for me. And maybe it’s because of that peace—a peace not dependent on my circumstances being easy or happy or predictable, a peace drawn only from the Lord—that I feel no need or desire to set goals this year. I don’t need to improve dramatically at anything; I just want to continue growing in general in the roles I have been placed in. I don’t want to get passionate about new things; I want to choose joy in the current things. I don’t need to start anything new; I need to keep going with what has been started for me. I have less and less need for MYSELF to make changes and more and more desire for the Lord to increase in me instead. My mom took a few photos in August that sum up my desires (and challenges) for the year ahead. My hope for 2015? That I can savor and embrace what I already have—the challenges, the joys, and the unexpected moments. They are all gifts from God. And I want eyes that see and a heart that says thank you. I am writing this final chapter of Riley’s story in my new dining room in my new house—the house I wasn’t looking for and didn’t know I needed, the house that is blessing our family immensely. A few feet away from me sleeps a baby I could say similar things about. 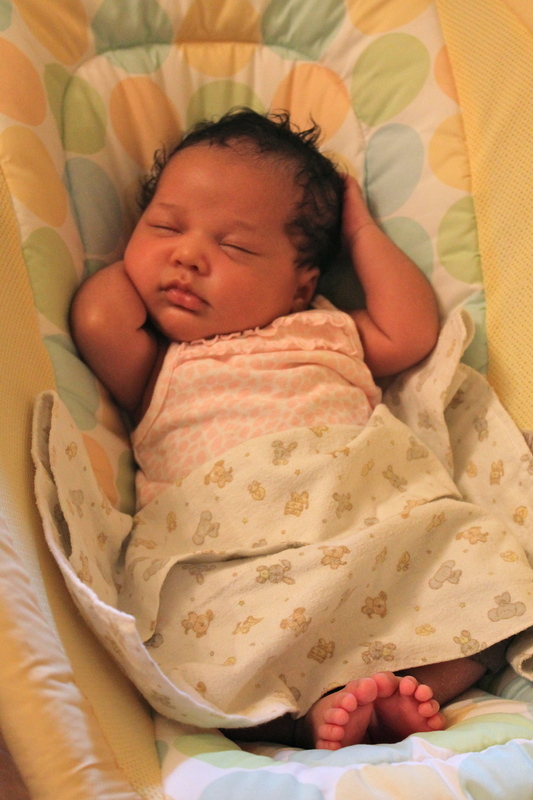 She has the most peaceful temperament of any baby I’ve ever met. She is immensely loved—not just by us, but by her biological family, by her extended family, and by her spiritual family of friends and family—and their love for her is a beautiful reminder of what is good and right in this world. She was meant to be ours. I will back up a little now and finish the story. But I just had to say this first: in case anyone else out there finds themselves in a situation, wondering what is God doing??!! He is doing something good. That verse that says He works all things for your good? It’s true. And I’m learning that you don’t have to understand it all. You just have to thank Him for what you do understand, and let your faith in His goodness carry you through the parts that don’t make sense. 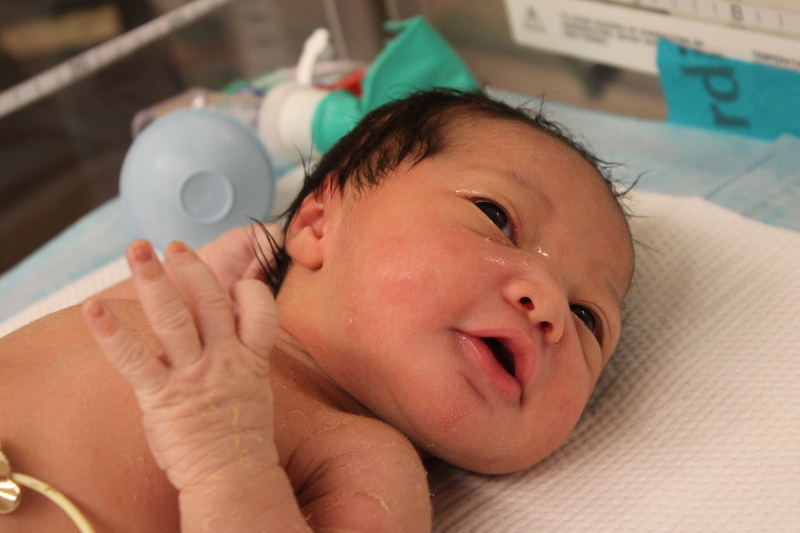 We got to the hospital around 4:30 pm on June 21. Riley’s birth mom, “P,” had been induced the night before, and we were all expecting a baby to come that night. We spent hours that night with the birth parents and the biological grandmothers, chatting as P had contractions. I challenged myself to stay present and tried to soak each part of the conversation into my memory so that if this baby came home with me, I could tell her details about her family…but I have to admit that my impatience was getting the best of me. I just want to meet this baby. Why is it taking so long? I asked God. Around 10 pm, I left the room to go to the bathroom. 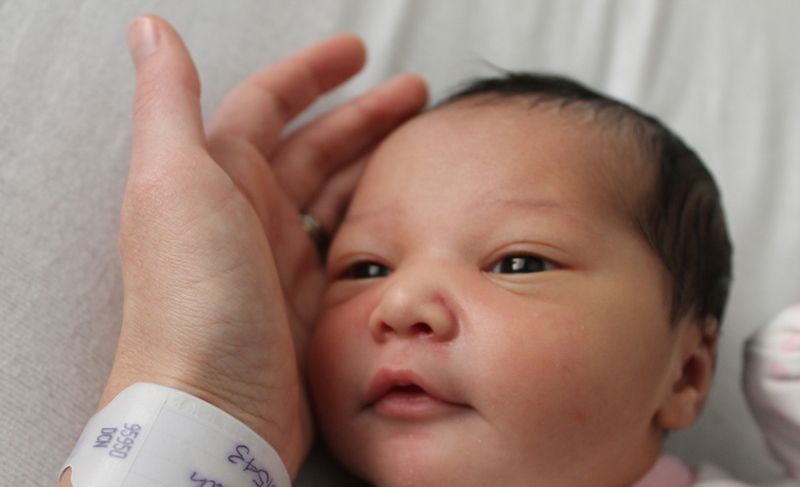 The birth dad’s mother followed me out and there, under the dim lights of the hospital hallway, asked me a rapid-fire series of questions about myself, David, our faith, adoption, and our hopes for this baby. We talked for almost thirty minutes and wound up hugging and crying together. At this, I decided to pipe down my inner Thomas and trust God’s timing. I was not going to ask Him one more question. I was going to enjoy this ride! David and I wound up spending the night at the hospital, as the doctor said that if anything changed, they would have P begin pushing right away. 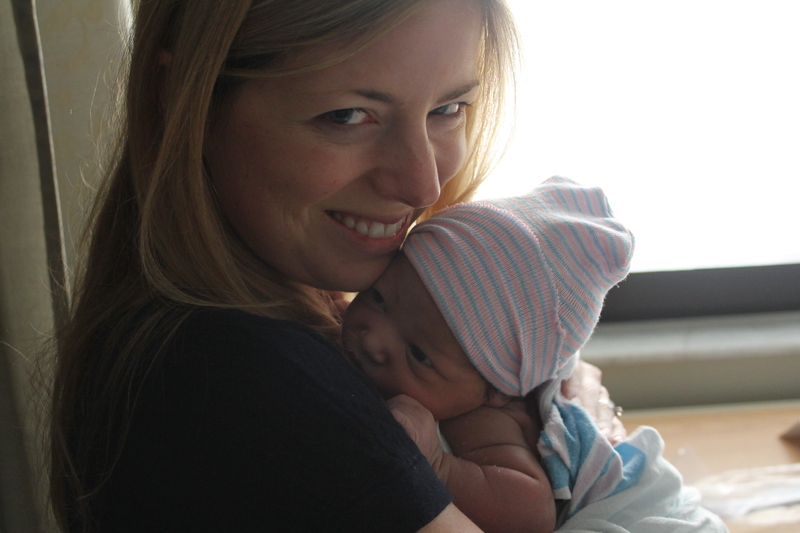 P had invited us to cut the cord and catch the baby—a tremendous honor and an opportunity we were not going to miss. We got a few hours of sleep on a combination of a borrowed hospital bed and the vinyl family waiting area couches. No baby came. The next morning, we were exhausted. 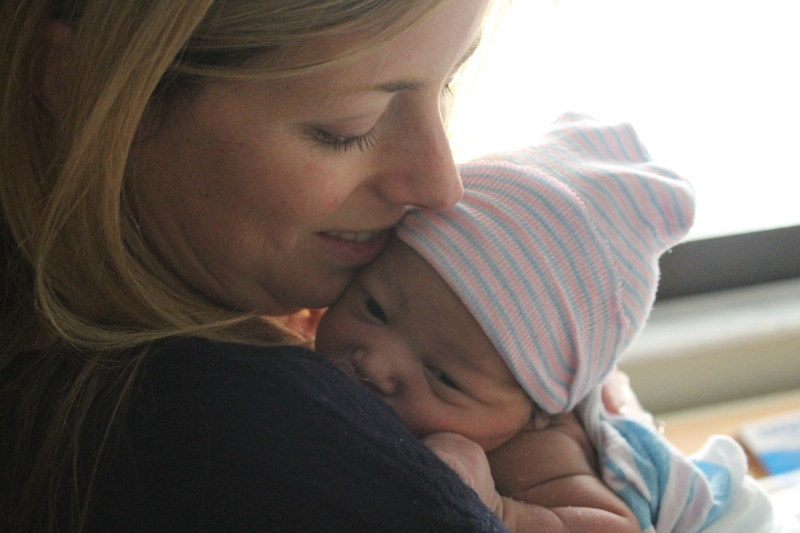 We couldn’t imagine what poor P felt like, and so we were relieved for her when the birth dad came in and told us “they are doing a C section, starting now.” The time? 8:30 am. 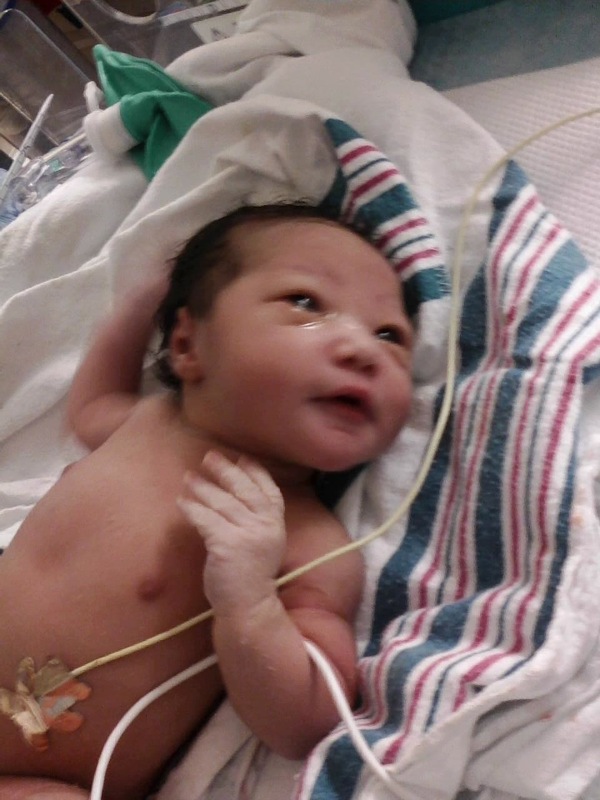 At 8:50 am, a beautiful little girl entered the world. 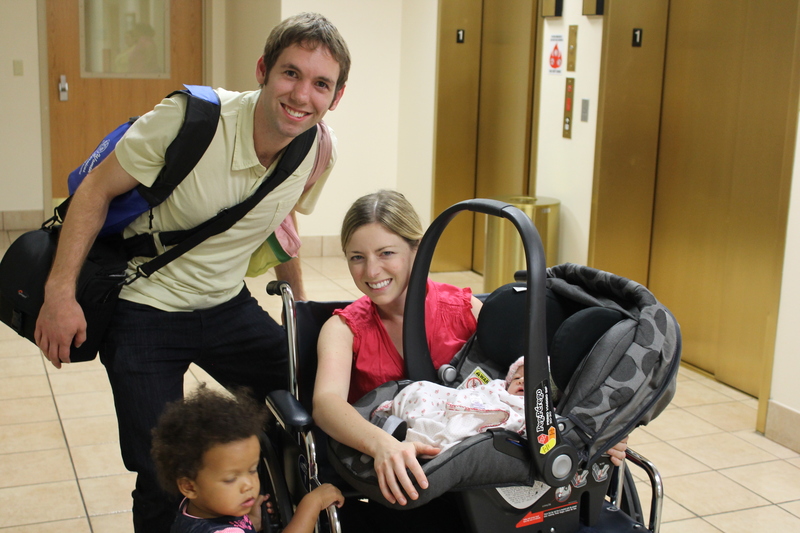 At 8:54, we were invited to gown up and head into the infant nursery to meet our daughter. We actually ran into her on the way into the nursery. I instantly burst into tears. “She’s so beautiful,” I said. “She’s so beautiful.” It was all I could say as I looked at her, thinking of our journey to get here, thinking of how much I had longed for and prayed for this baby. My mind sped through the past I looked at her thinking, this is happening in the present—in MY present. There is a baby in front of me and she is moving, squirming, looking around, and these nurses are calling me “mom.” I am crying and feeling real tears fall on my arm. I just drank a large coffee so I know I’m awake! This is not a dream! 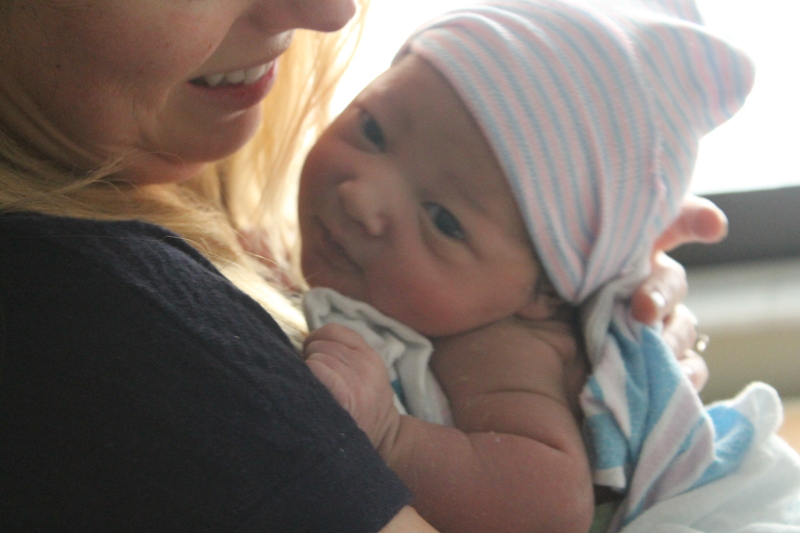 We stood watching her in awe as the nurses examined her. She looked around—cooing, interested, alert. I could barely breathe. We invited the birth dad and biological grandmothers to come in for a while to see her while the nurses finished cleaning her. 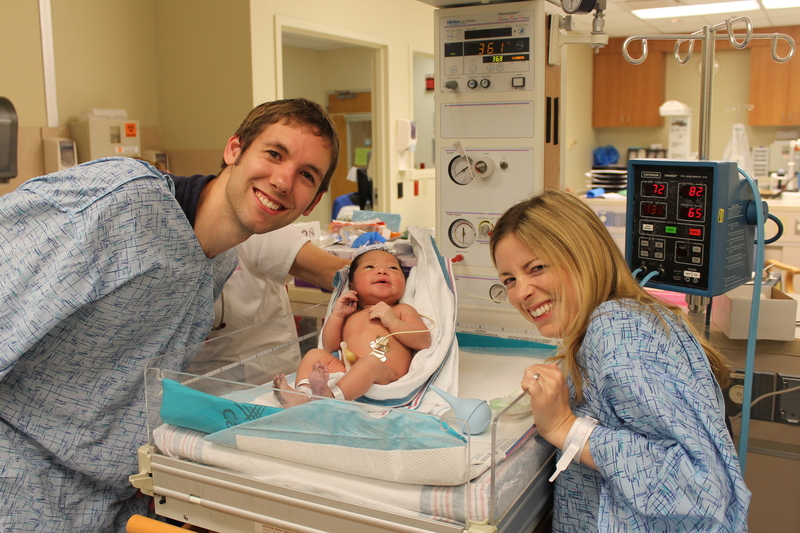 Then, the nurses told us to go to a private room to spend some special bonding time with the baby. 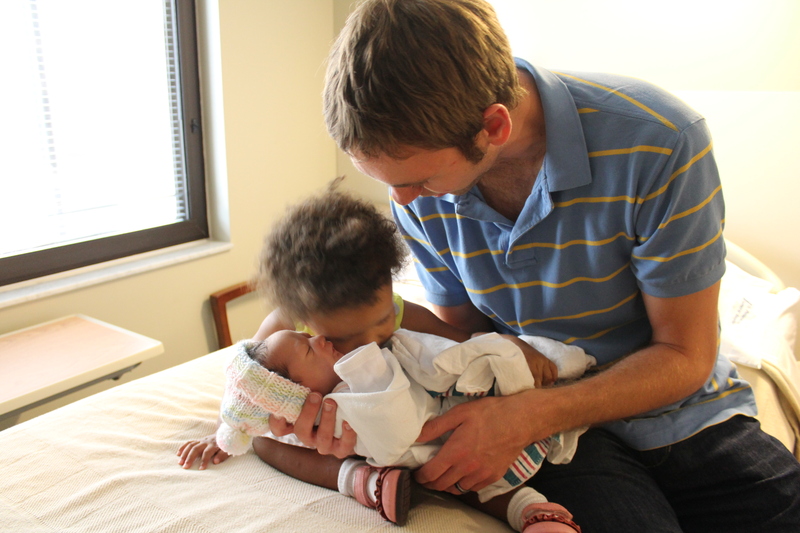 We couldn’t believe that we were getting this privilege as adoptive parents. As each moment passed, we fell deeper and deeper in love. As the day went on, we learned that the birth parents wanted me to stay in the hospital and begin caring for Riley right away. The nurses gave me a room, ordered meals for David and me, brought me towels and shampoo (I hadn’t showered since Sunday night and it was now Tuesday afternoon) and generally made everything lovely. For the next two days, I stayed in the hospital with Riley while David went back and forth from the hospital and caring for Zoe. A few times a day, we’d truck down the hallway to P’s room. It was beautiful to watch P and Riley’s birth dad interact with her. I don’t feel comfortable sharing a lot of details of their story or their time together, but I have a beautiful set of photos that I will show Riley someday. She is a profoundly loved little girl. Any parent who has been through a “traditional” matched domestic adoption will tell you that the time in the hospital is a roller coaster. 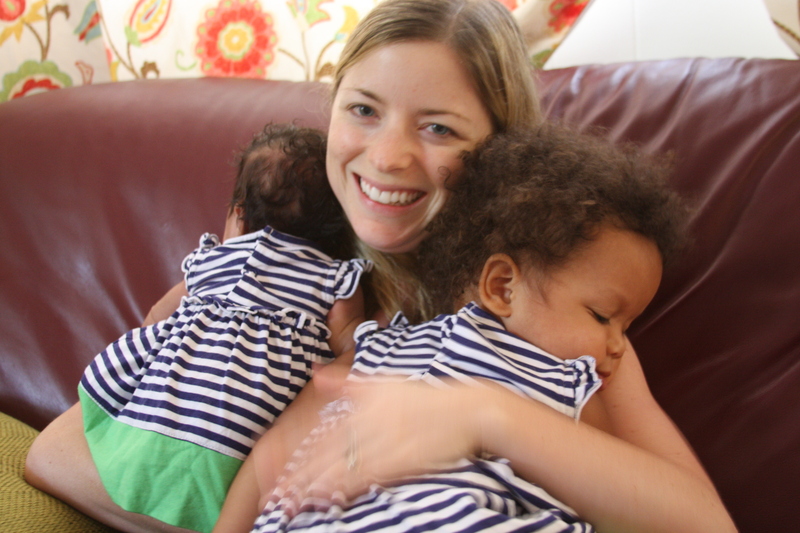 You are falling in love with and caring for a baby that you aren’t sure you will take home. You are interacting with biological family members who are on their own roller coaster. You are aware that you are constantly being watched; that every action has a potential impact. My desire for this time was to show the love and unconditional acceptance of Christ to the family—not to manipulate anything and not to worry about the outcome. I wanted our time together to leave an impact on the family whether we took the baby home or not. Throughout our stay, God was faithful to encourage me that this was happening. In one of my favorite moments, the birth dad’s mother pulled me aside on Tuesday and said that our conversation the night before had encouraged her more than I could know. “I had to leave the hospital on Monday afternoon because I was so sad thinking about saying goodbye to the baby,” she said. THIS is adoption at its finest, is it not? I was so joyful. But as I described, it was still a roller coaster. In Florida, the birth parents sign their parental rights away, thereby placing the baby with you, 48 hours after the baby is born (the birth mom also has to be painkiller free for 4 hours prior to signing.) This would put our signing on Thursday morning. 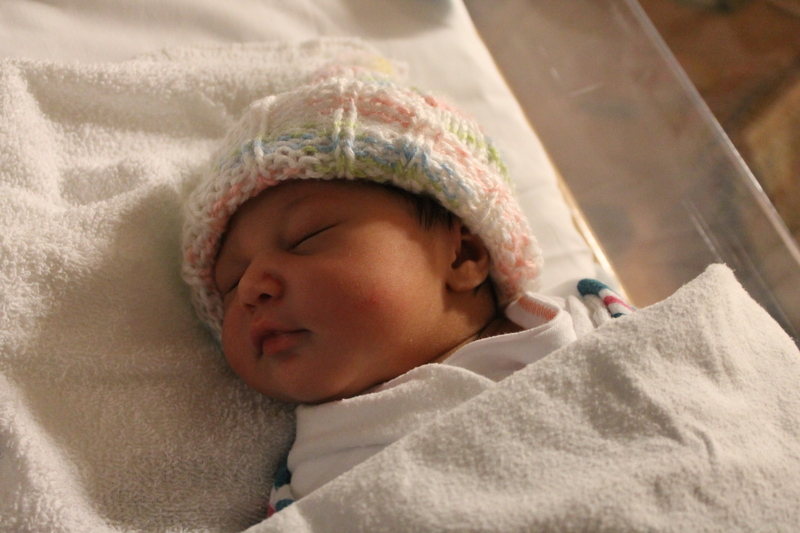 For most of our hospital stay, I felt joyful and at peace. But on Wednesday night, I felt like a wreck. I was exhausted. I was alone in a noisy hospital room with a baby that was having some feeding issues (since resolved) and that may or may not be mine. I felt sad for P. I felt the reality that P could choose not to sign; that this could be my last night with Riley. I felt the temptation to detach. I felt the weight of the failed adoption. I felt alone. I said into the darkness, I am not alone. And I began talking to God about this baby, my feelings, all of it. It wasn’t coherent or organized. It was a jumbled prayer of fatigue, my desires, my questions, and my reality (honestly, I think this must be His favorite kind of prayer.) I talked through our journey with Him, asking again, what was any of this? If this was supposed to be my baby all along, why did all of that happen? Why did I feel that call to adopt in October? It was so random. This baby probably wasn’t even conceived then! I pulled out my cell phone calendar. My hands began to tremble a little as I counted backwards. Sure enough. Riley’s due date had been July 9. This meant that the week that David and I had started praying hard about adoption together—the week that he had said “I am actually really excited about the possibility of a newborn”—the week that we decided that we felt called into the action of pursuing adoption—the week that we started praying for whoever our future baby would be—was the week Riley was conceived. We had been praying for Riley since she was conceived. We just didn’t know it. And there, in that darkness, I relaxed into this truth: this was our baby. I don’t always understand how God works. I don’t. I don’t understand why a good and loving God wouldn’t just give me my baby without the painful loss preceding it. But He gave me a baby, y’all. Hallelujah! I also know that God doesn’t allow useless pain, and I also know that He gave me the encouragement that the situation with Zoe’s birth mom wasn’t about us. Through our experience I’ve grown, I’ve been humbled, I’ve learned to understand others better, I’ve learned more about life and grief and marriage and parenting and faith and friendship, and who knows what He’s done with it in others that I don’t know about? Would I trade all that for no pain? Probably. I’m weak and human. But I can also say “thank you” for the pain. Adoption offers plenty of sweetness and bitterness. LIFE offers plenty of both. And God is in both of them. And, like this dining room I’m writing in, His work might be unexpected…but it is always good. I look at the baby sleeping next to me, and I listen to the early morning singing of my other baby in the next room (I’ll need to get her soon!) and all I can say is thank you to the One who has given this life to me. I don’t deserve it. But I hope to steward it well. For reasons I do and don’t understand, I’ve felt called to share our story with you along the way—the good, the sad, the ugly. I hope You see Him in it. 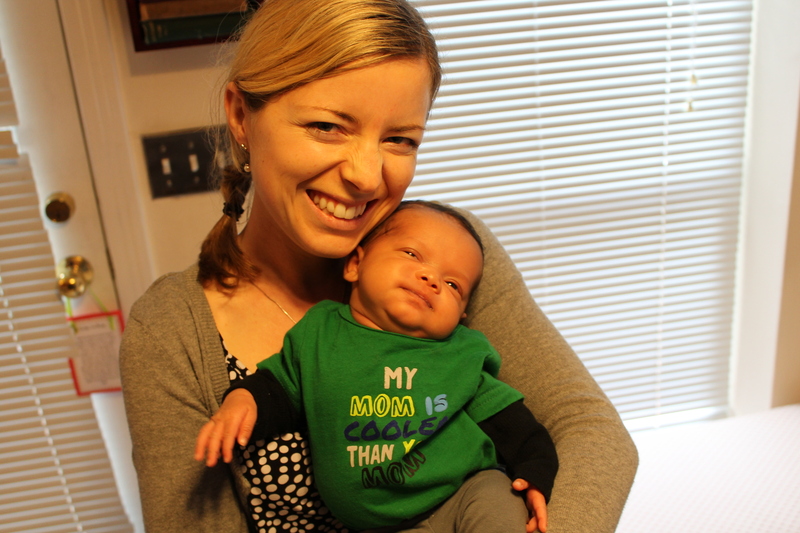 This post doesn’t need much of an intro: motherhood changes a lot. Here are three things I never, EVER saw coming in my life. 1. I never thought I’d purposefully sing horribly to my child. I have a decent singing voice. I grew up singing in show choir and concert choir and church. 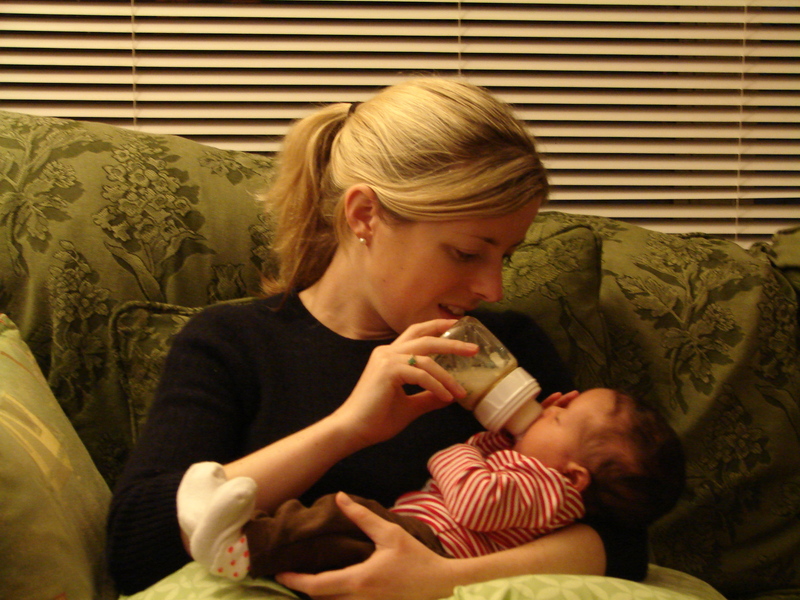 When I pictured motherhood, I always imagined myself sitting in a rocking chair and singing to my baby while I fed him/her. Our bond would be unbreakable, my music beautiful. In reality, my voice puts Zoe to sleep immediately. Avoid our house at mealtimes unless you have ear plugs and an internal well of patience. If you’re tone deaf, on the other hand, feel free to stop by. 2. I never thought I’d drive with my newborn on the Interstate. The Interstate is my personal nightmare. On occasion, I will very begrudgingly hop on, but the entire time I pray GODPLEASHELPMENOTGETHITBYTHESEIDIOTSOHGODPLEASE, maniacally sing songs trying to ignore my fear, and take deep breaths to try to stop my hyperventilating and sweating. It’s a roller coaster ride for me, one I thought I’d avoid with my children. Because generally, adults should seem calm and in control around kids, right? 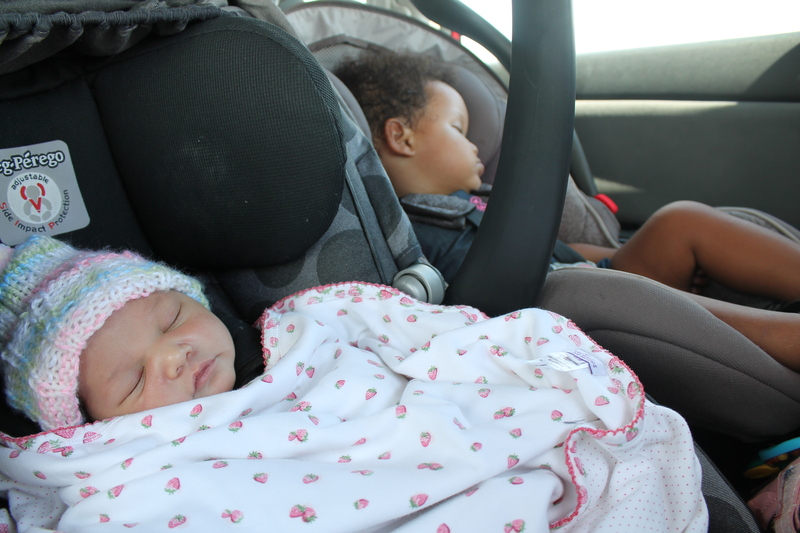 But last week, I piled the tiny love of my life in the back of the car for an Interstate drive. To pick up breast milk. Yup. You read that correctly. 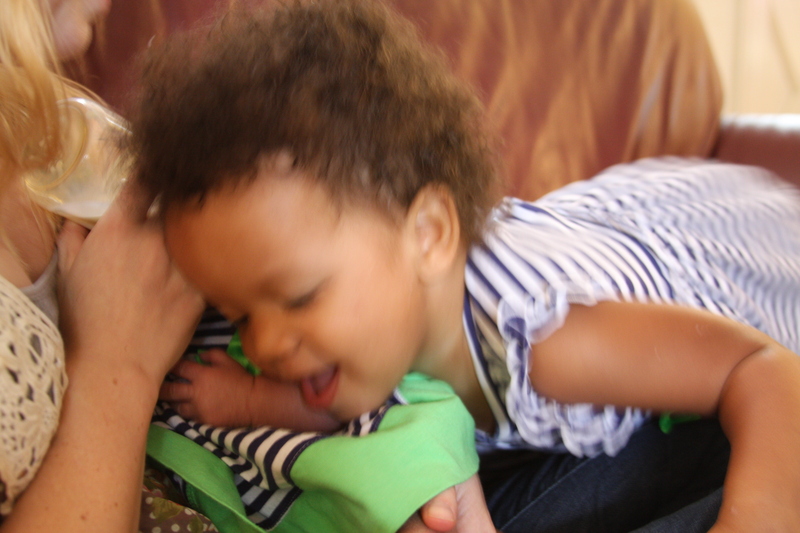 We are supplementing Zoe’s formula-based diet with donated breast milk from two healthy friends. One of them had her baby 9 days ago and messaged me when she got home from the hospital last week: I have about 10 ounces of rich yellow transitional milk. If you want it, it’s yours. Of course I wanted this precious milk. The only problem: our friend lives about 45 minutes away by Interstate, an hour plus by alternate routes…and Zoe eats every 3 hours. If we wanted the milk…I had to face my fears. So my baby and I set out on a terrifying Interstate adventure. For breast milk. Never thought I’d write that sentence. 3. I never thought I’d become a stay at home mom. I NEVER in a million years thought that I would claim this job title. I loved my job and was thrilled to have the opportunities that I did there. But having Zoe has changed so much for me. It’s you and me, kid. Get used to it. I could talk about this decision for hours (and I did.) But the main point is this: God led me to this decision. Staying at home was definitely not my starting point, definitely not in my plans, and definitely not something I really WANTED to consider, to be honest…so for me to even begin considering it was a miracle. For me to feel peace and joy about it was truly God’s direction in my life, His gentle whispering of better plans than my own, His gentle question: will you surrender to me? The stubborn part of me would like to say I fought Him hard, but I didn’t. Instead, I followed his direction to think about the kind of mom I want to be. I want to be present, non-stressed, joyful, and energetic—a mom who has time to answer all the “whys” and to play and to smile. I want to be the one who teaches my child about God and how life works—because I don’t know if someone else will teach her what I want her to know. I want to be consistent for her, available to her—not just home for breakfast, dinner, bath, and bed. I want to give Zoe rich experiences with her extended family—which is difficult to manage with two full-time jobs when none of our family lives within driving distance. As I honestly surveyed my life, I knew that if I continued in my level of position, I would not have the energy or time I want to spend with Zoe or my family. Many women can work full time and be great moms, but I care so much about my work that I end up sucking at managing my work-related stress and pressures and setting boundaries. David’s summer travel schedule and school schedule are not conducive to me working full time with a daughter. Our family would have to sacrifice too much just so I could be “professionally fulfilled” and so that we could have a little more money. Zoe deserves better. David deserves better. I deserve a better experience as a mother, and honestly, my heart yearns to be with her. So last week, I resigned from my position. Thankfully, my boss was open to me continuing with our organization in a very part time consulting role! So I will be working 5-8 hours/week, mostly from home, doing some public speaking/training, some program evaluation, and some grant writing. This means I can obey the pounding in my heart, but still stay involved with the organization I love and keep my toe in the “professional water.” I couldn’t be more pleased. I was talking with a friend on Friday and she said she had been praying almost every day for six weeks for my heart to be open because she felt that I needed that prayer, whatever it meant. I know what it meant, and I am just so thankful for the power of prayer, the loving act of people praying for me, and God’s quiet, gentle grace as He makes us into the people He wants us to be. 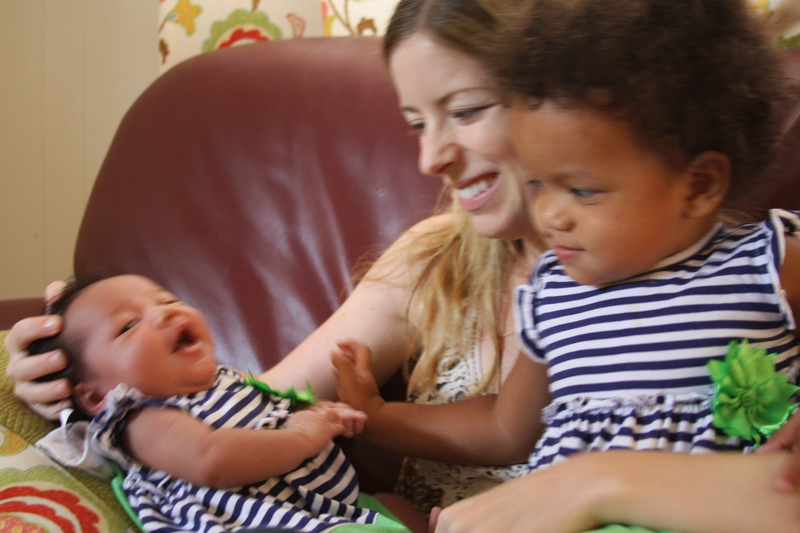 Motherhood has been full of fantastic surprises, and I’m excited for the next batch of surprises to come. I have always been a writer. I have often been a blogger. Blogging helps me process my thoughts and feelings and understand myself and my relationships better. Blogging is all about community–it starts a conversation and gives perspective that my journal can’t, and in the process, I have built some fabulous relationships. About six months ago, I stopped blogging. I had gotten busy at work, was feeling a little exposed when I posted, was running around town trying to finalize adoption paperwork, and wasn’t feeling inspired anymore. My blogging urge is back. One could argue that the week that you have a child is a bad week to start a new blog. I’m busier than ever. I’m riding a wave of sleep deprivation that makes me dumber than rocks (and makes me use uncreative metaphors like “dumber than rocks.” Looks like my usual witty writing voice may be on hiatus, folks.) The crowning achievements of my day yesterday were getting my child to burp and getting through my loads of laundry–not exactly scintillating writing material. But when I blog, I’m more intentional about how I live. And in this new stage of my life as a mom–which still feels weird to type and weirder to claim!–I want to be intentional. I want my little Z to have a mom who is fully plugged in to life and to the One who has given her life. And so I think…I think…I may blog again. And this time, I may even share my thoughts with people I ACTUALLY know.